2613 Double Sided White Paper Tape Acrylic Adhesive is manufactured from paper base coated on both sides with a acrylic adhesive. It is supplied with a White Glassine coloured siliconised liner. 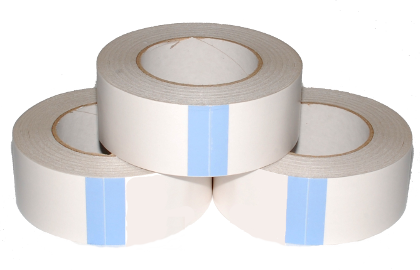 2613 is a general purpose splicing tape suitable for virtually all substrates with the exception of siliconised paper. Solvent-free, environmentally friendly double-sided adhesive tape with special paper carrier. The outstanding viscoelastic adhesive formulation makes it particularly suitable for coarse-pored material surfaces. The rolls should be stored flat on their cut edges in the original packaging. The product must be protected from dust, heat, moisture, direct sunlight and solvent fumes. Storage temperature about 20°C.